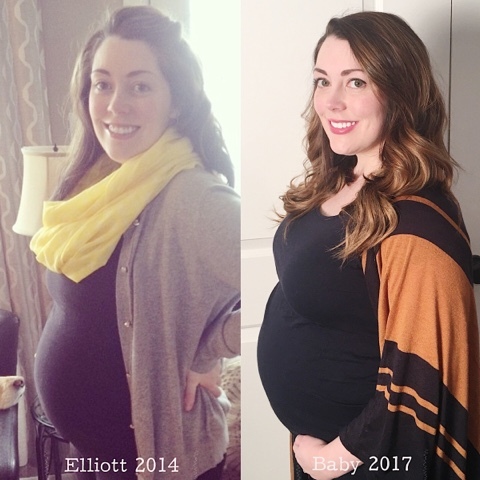 Weight updates are some of my most read posts! and I understand why... people are nosy..
if you're reading this you're probably nosy, we're all nosy and also we like relatability. but lord I hope I never go viral because those relatability girls get tore up by commenters over weight and appearances. that's sort of why I have to ramble on before this weight post.. I could just say "here's the weigh in!" but I felt like I wanted to say more to the couple hundred of you who stopped by because you saw 'weight' in the description. Now if you're open minded to the fact that we all have different genetics, life stories, capabilities, body shapes, food incomes, education, health issues, etc. keep reading! and if you're really here just nose around at what I look like pregnant and in a bathing suit, scroll down my friends!! I don't know many people who don't get sucked into the roller coaster of love/hating their body and/or appearance at some time throughout their life. I've been struggling for 30 years and counting, I think women are especially hard on themselves and each other. I love men, I know men who struggle, I have a son and I plan on using the same language on him as I do my daughter but I still think when it comes to our outer appearance, women take the majority of the blows. I've been with my husband for 11 years..
and the one thing people always say about him is, "he is the total package". well of course he is the total package! I picked him that way..
he's kind, hard working, patient, intelligent, the list goes on. most of the things I and other people ramble off about him aren't relating to his looks or weight..
we see him as the total package and then the "oh he's also a hunk" is an afterthought..
but things like that get me thinking..
how little we use terms like "total package" when talking about women. I watch The Bachelor, I hear those descriptions thrown around all the time when its referring to men. mediocre men, average, but good, but not mind blowing men. then when it comes to women, it seems like she does have to be mind blowing to be the total package.. and for some reason weight and looks is bumped to the top of that list. all of this plus you best be holding down a 40 hour work week, hit the gym at least thrice, and be greeting your husband with a happy you're home smile and kiss. that's what I have to be to be considered the 'total package women'? Yet I still know I am the total package. I've known it my whole life. that's not meaning that I've never felt the social pressures, the comparisons, the beating yourself up for not being thin enough, pretty enough, teeth aren't white enough..
and a small part of me will admit I open myself up to these criticisms because I am a blogger, I enjoy beauty, I love fashion, I focus on some may say, frivolous things in the blog. I'm not posting those hard hitting political pieces or talking about climate change. 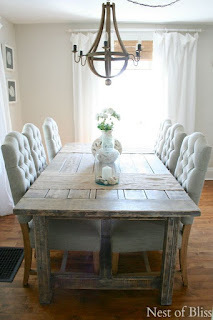 the blog is where I like to keep it light, fluffy pieces are my forte. but even before blogging, people were fixated on my outer appearance..
some of the comments people have made to me throughout my life make me cringe with embarrassment and then redden with anger.. and not for me, for the people who made them. which often times was family or peers. I would never say these things out loud, they're so heinous the only people I will tell them to is my husband and my therapist..
it amazes me that I don't have more mental health issues and/or body dysmorphia. but the sad part is, I don't think my life has been even slightly abnormal! I think its normal for people, especially women to grow up dodging bullets of body slander, hate or shame and it seems like it never ends. I mean you can be Meryl Streep or The Queen of England and the press is still going to talk about what you wore that day versus what accomplishments, achievements you've made. I am going to share my weight gain/loss story with you. I will share the photos and numbers I think its a valuable resource to share, it's your average persons story. I love the Kardashians and I would do exactly as they do if I was in their situation, but let's be real about their appearance, pregnancy stories, etc. they have A LOT of help. Chrissy Teigen said it, they have help. Kourtney Kardashian is a single mother of 3 and works out like a beast EVERY DAY. Kim Kardashian is getting every poke, laser and injection she can for the tiniest of wrinkles. So if you're following those ladies, that's good, I love them, they're beautiful and inspiring! but please come follow some ladies like me as well. whole package women who know it and dodge the bullets daily but still come out feeling good about themselves. The one positive force that has been steady throughout my life is that I've always picked partners who never saw me as my outer shell. They have always known how valuable my whole being and soul is. I will show my husband photos from a few years ago when I weighed 25 pounds more, I'll see a different person but he says "huh, I never noticed" and I honestly believe him. I know he sees through all the fluff to the whole package. he thinks I'm beautiful of course, but at the end of the day if I had a Drop Dead Diva experience and woke up looking nothing like 'me' (which hello.. pregnancy basically does to you, different hair, skin, nails, smell, weight, etc) he would still see the total package. when I went to the doctor 2 weeks ago I was floored to see I was at 190 already. yikes my goal weight is creeping up! I was surprised and not surprised.. I haven't been able to move this pregnancy and I've been starting to feel the 3rd trimester pains set in so its really been a struggle. I have dreams about being on the treadmill and wearing yoga pants again! I salivate at the thoughts of working out and dropping my kids off at the gym daycare to gain those peaceful minutes walking on the treadmill listening to music. but I physically cannot do it right now. the meds I am on make me SO sleepy, and the nausea is still on high alert. the doctor said "I know you're feeling miserable and I know I go for carbs when I am sick and tired but you can work out..."
I'm not sure if this doctor has kids or not but I still think people take pregnant women for granted. I know some women have beautiful pregnancies that are amazing but mine are torture and I struggle to get dressed. really, I may get dressed 3-4 times a week? when you see me out in public you'll say I look great and wonder what all my bitchin's been about but the truth is much uglier my friends. 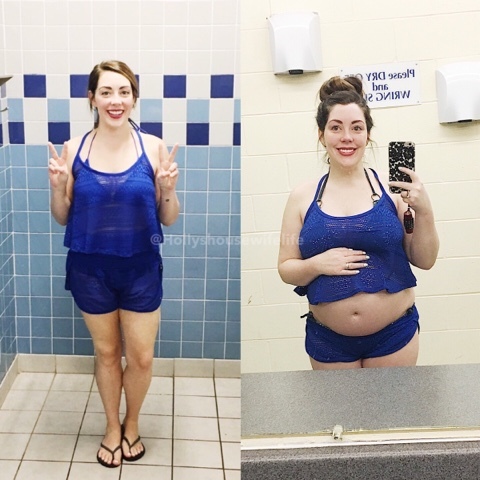 we've been going swimming, I am increasing my water intake and trying to just move more in general. I don't want to get too far above that 'goal' weight. I'll probably drop 20 pounds or so after birth..
just baby, water, placenta.. gross stuff happening, you lose a chunk there. but that will still leave me with a hefty load that I hope I can get under control by the end of my mat leave. when its all said and done I expect to weigh more, my body has gone through a massive change but for my health and my energy I'm setting my Summer 2018 goal weight to around 150 pounds. I'm less concerned with that number and more into the feeling I hope I can get back. 2 kids is going to be brutally exhausting and I still think I'm naïve to what that's going to feel like..
he was a dream baby, happy, excellent sleeper, hardly ever cried and its delusional of me to think I will strike that lucky charm again! and wish me a better weigh in next week! yes, only next week and I have to hit up the doctors office again! I'm winding down to the doctor every 2 weeks now, that's good and bad news! yay almost baby time, eeeekkkkk almost baby time! Let me know if any of this is relatable or if my atrocious lack of writing skills has left you scratching your head.. I had no intention of sharing this today but I'm going to try to post more on real time posts for y'all when I run into something cute! so I'm not sharing weeks later when the thing is out of stock.. oops. 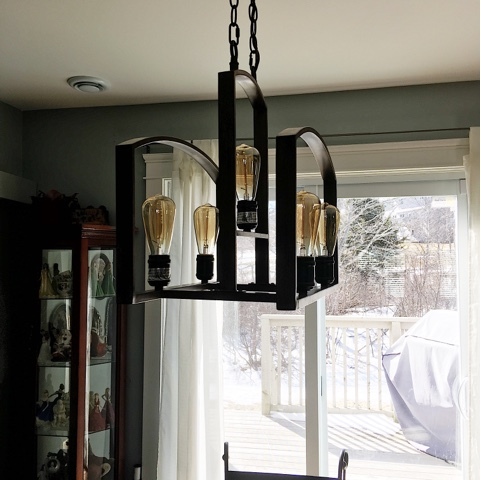 that's not referring to my Costco light fixture though!! inside knowledge told me people were still able to find it at Dartmouth Crossing Costco! man, blog shaming has been running rampant these last few weeks..
my fellow bloggers are you feeling it??? but this is another story for another time. ^ these baskets are just too much for me (as in cuteness! ), I want them all! 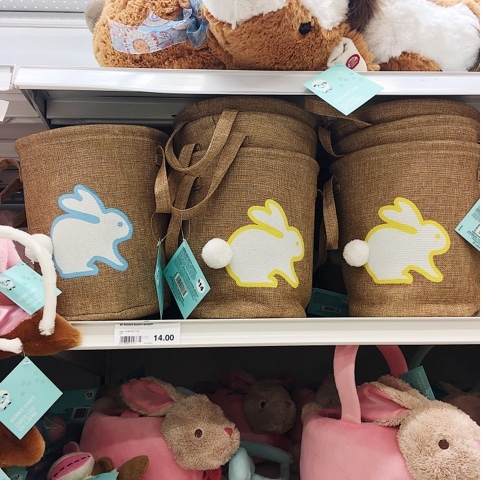 I was at Superstore last night and they have the cutest Easter stuff out! 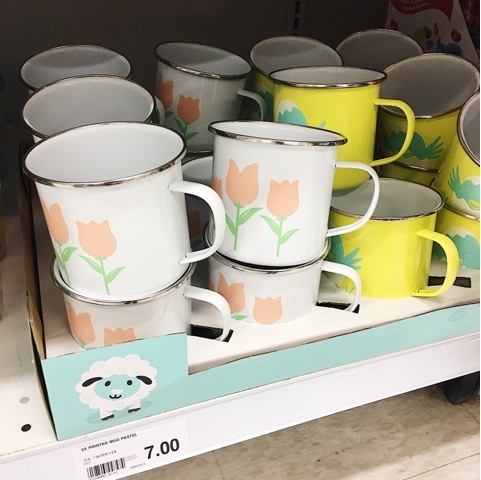 I didn't get to snap as many pics as I would have liked because Elliott was LOVING it..
^ these mugs! why are you so tempting?! 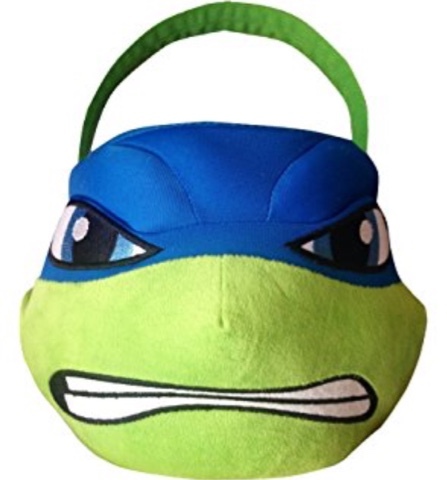 I resisted because I am trying to declutter my life..
and also do you remember last year when I got this ^ Ninja Turtles Basket at the bible thrift store for $2.99 and then I spotted THE EXACT basket at Superstore for $15 ?!?!?! So I try to live my kids lives only through thrifting..
so far for this coming Easter I've picked up 3 t-shirts on a buy and sell, brand new tags still attached! bunch of inexpensive finds like play dohs, dinkies and a pack of those dinosaur eggs that you let sit in water over night and a dino hatches! I think Elliott's going to get such a kick out of them if he can grasp the patience concept! 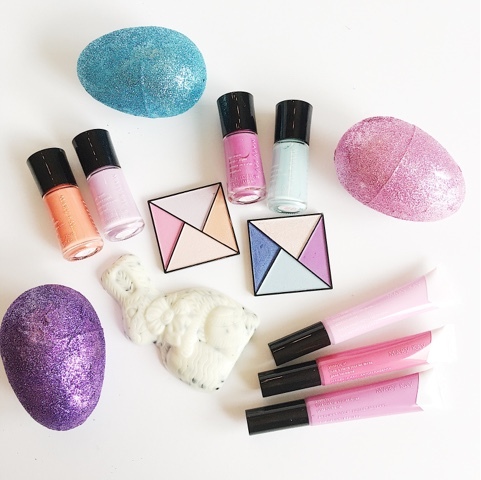 also found the dino eggs at Superstore ^ they were in an isle on a random display, you know the kind where they sometimes have sippy cups, curly straws or sandwiches containers hanging. I will try to snap a pic for Instagram so you can see exactly what they look like! 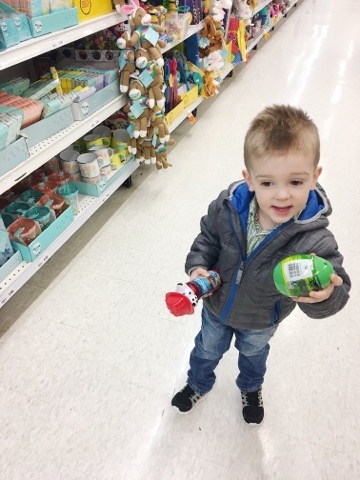 He was in love with all the little bits and bobs, he really wanted the Paw Patrol bubbles and this ninja turtle egg. 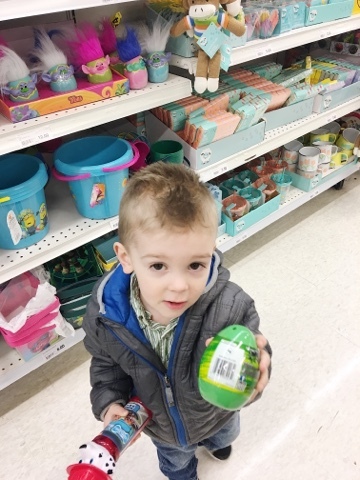 I was just in shock that he didn't want the Trolls eggs shown in the background! 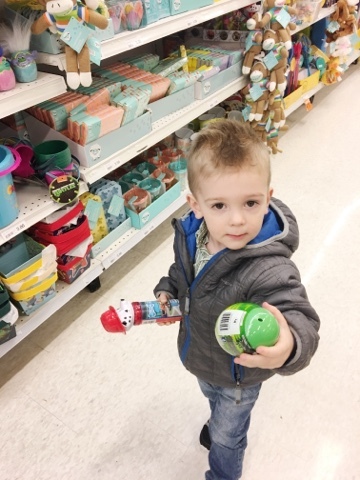 I told him one or the other so we left with the bubbles but he hasn't stopped talking about that turtles eggs for the last 24 hours, so I may have to sneak it into the house for Easter. 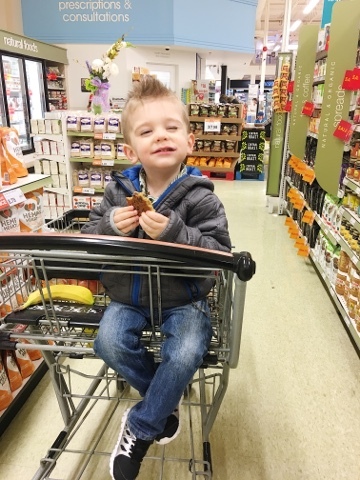 Superstore is our fav because they give free fruit to the kids and also free cookies! which was insanely expensive if you ask me. $135 dollars to register a 3 year old, then you need to purchase cleats, shin pads, socks, shorts AND you have to be on the playing field with them at this age. It hurt my frugal pocket book to do but I really want Elliott to have the option of sports in the future and figure out what he likes/doesn't. "I wanna pay (play) Hockey"
"uh huh Hockey sticks! I wanna pay Hockey. Hockey. Hockey. Hockey"
so we will see how he likes soccer! they start in June. I will update my weight story tomorrow, I've been needing to take some current photos and they are not my friend at this stage! its more like can I work out between vomiting, headaches and back pain ?! + a 2.5 year old glued to me. that is the issue doc..
but I am trying! so I think we are going to hit up the pool today and I went swimming once last week so that counts right?? I just cant be anywhere near the jets that pump water into the pool, I may as well be on a roller coaster. Although its been blah outside, my back pain is killing me and I feel like I'm living in an inflated sumo wrestling suit... I'm in a pretty perky mood! 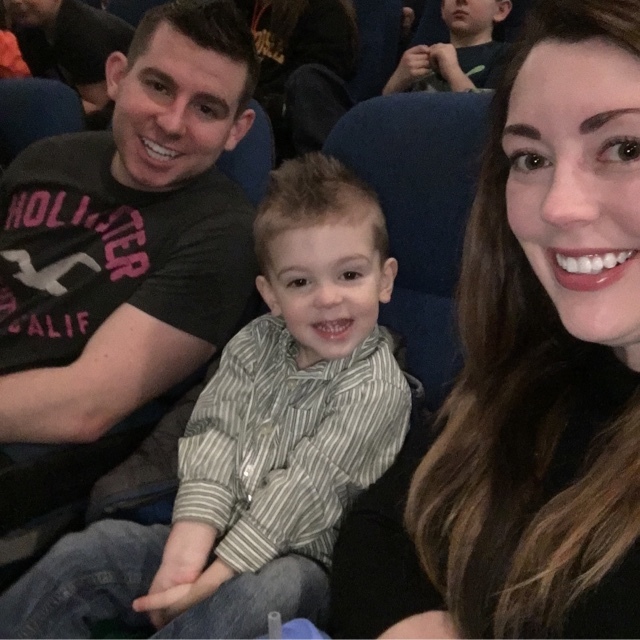 we just took Elliott to his first movie at the theatre and it was AWESOME. 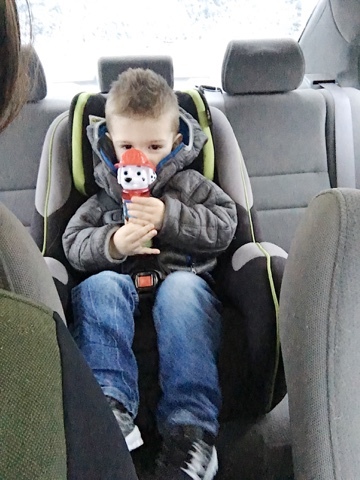 Cineplex is doing $2.99 kids movies all this week so we had to take advantage of it! 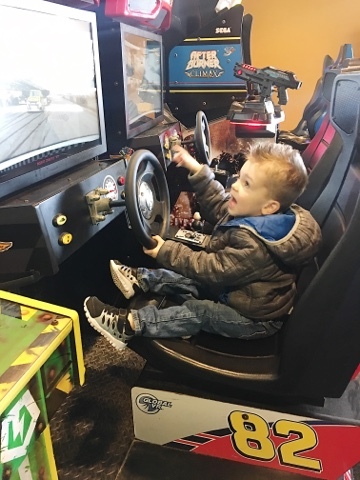 ^ the best part about 2 year olds, they think they're playing when in reality we didn't pay a dime! we went to see Trolls, Elliott is OBSESSED! we bought the movie a couple of weeks ago and he asks to watch it daily so we knew we could sit through at least most if not all of it. 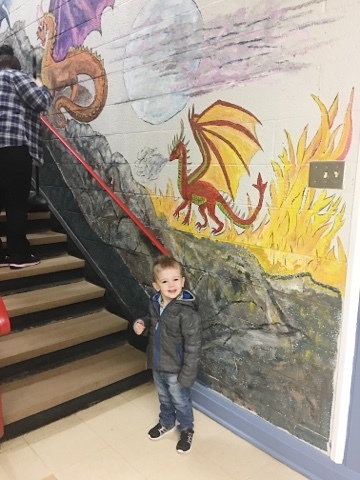 surprisingly he happily made it through the whole thing and the theatre was PACKED with kids and very young kids at that, but they were all so well behaved! I was completely impressed! a lot of that cred has to go to Trolls, which if you haven't seen I highly suggest! its fast paced, entertaining, good music and heartwarming. OK, besides that I am so pleased with my skin lately! I have been struggling through this whole pregnancy but I finally feel like I'm getting a tad bit over the oily, dry, breakout, redness, pregnancy skin stage.. I think a big portion in that is due to tedious care.. and just a sprinkle of luck. 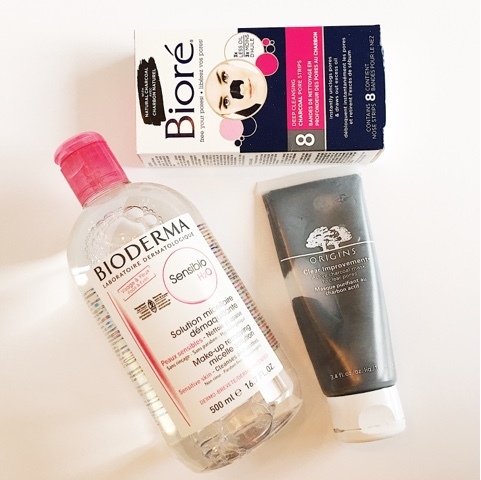 Biore charcoal nose strips, which aren't a NEED for me. I have fairly small pores but these work great on my husband who has life long oil issues. I threw them in more for a luxury, a once and a while treat for me. 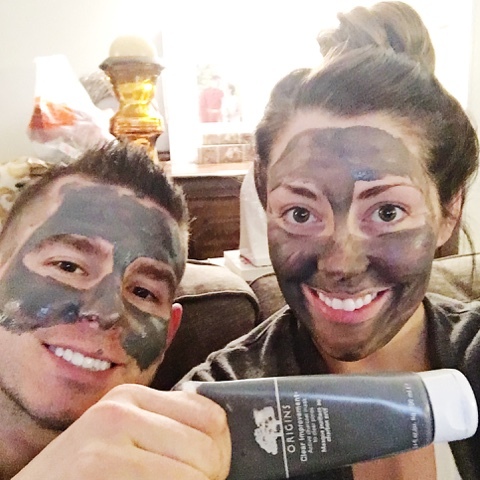 Origins all over charcoal face mask on the other hand.. has been AWESOME. I've always loved this mask, and although pricey $32.. that bottle will last you a lifetime! I've just started using it once to twice a week religiously and its dried up my blemishes perfectly. especially that one on my cheek that stuck around for the last ummm 3-4 weeks now. FINALLY, its faded to almost gone. I also found a FAVORITE that I forgot about! checked Sephora and looks like the packaging has changed. I am hoping its only the packaging because I LOVE this sorbet! but sometimes you have to stick with what works.. and this works for me. 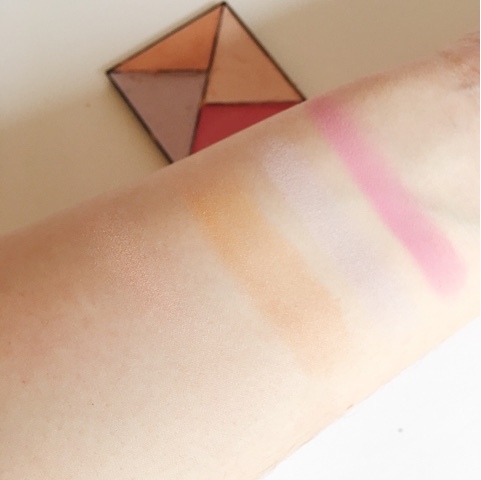 it dries into your skin instantly and sits amazingly under makeup. 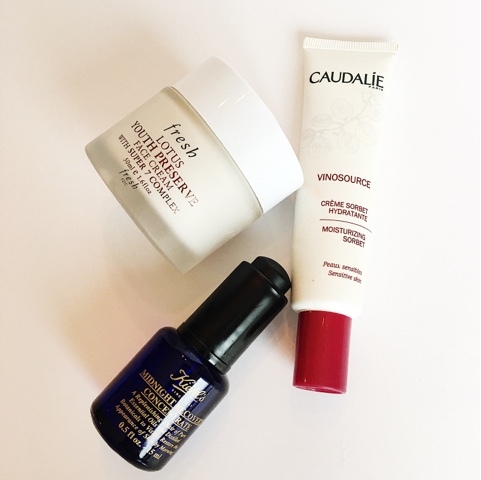 So I've traded in my fresh Lotus youth preserve for the Caudalie.. BUT only during the day. 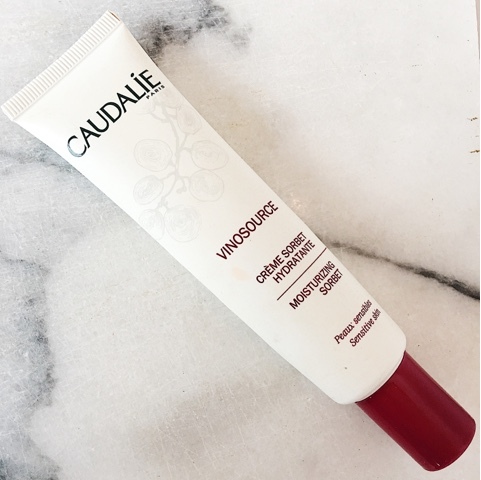 apply the Caudalie before my makeup. then fresh lotus youth preserve. the Lotus youth preserve is much heavier and can* just a tad* bring out my redness. 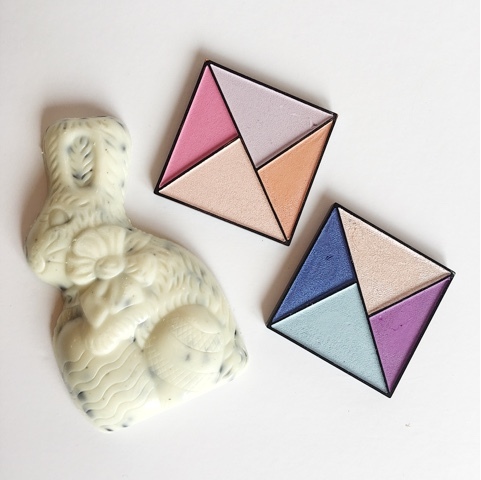 I've noticed a nice improvement with the light Caudaile under my makeup, I don't feel so weighed down. I know that sounds like a lot of steps on paper but in reality its maybe a 10 minute job. I use the time between every step to floss, brush and mouth wash. 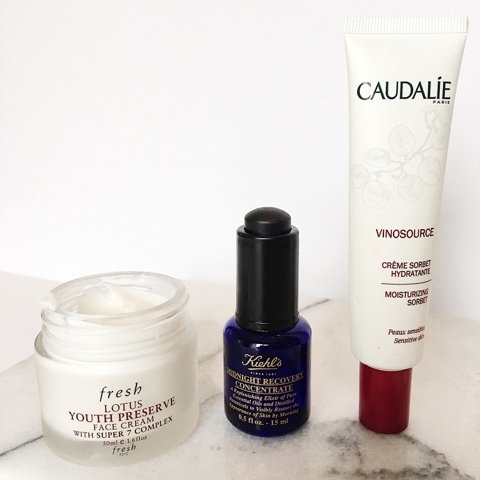 It's like my little mini bedtime routine and I feel so much better and relaxed crawling into bed with a fresh face. obviously my skin agrees because its been clearing up AND finally dry, dry, dry patch forehead has been looking plump.. I just opened up my cell phone camera to inspect the forehead and yup, looking hydrated..
am I the only one who uses selfie mode as a mirror?? I always do it on the sly in public to make sure I don't have lipstick on my teeth! What did you guys think of the This is us finale last night?!?!? I was a tad disappointed.. I'm happy with how much they dove into the Rebecca and Jack relationship but.... still no hints on his death?!?!?!?! I pretty much turn into a puddle whenever Jack or Randall speak. they're the best characters to me, I am so invested in their lives. so tonight we have Survivor and the season premiere of Big Brother Canada! 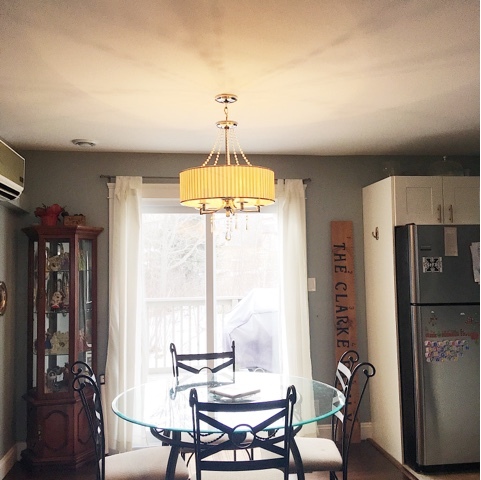 one of the best and worst qualities of our house is the open concept. there's only a small office (play room aka toy room aka I still have to show you how we decorated that tiny space but it is a MESS right now. It's one of my favorite rooms in the house, the super hero photos and 'PLAY' wall decal is so cute! 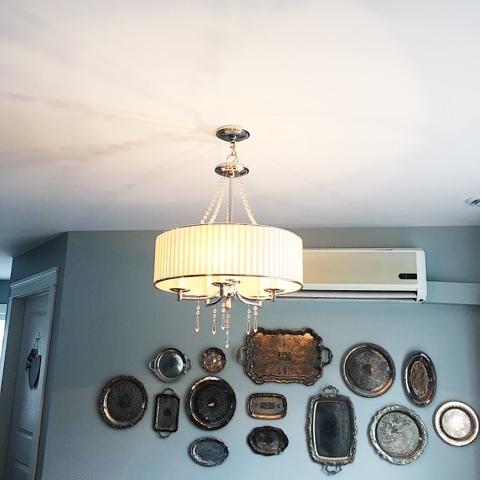 plus there's a adorable light fixture..
so there's a tiny office and a powder room. 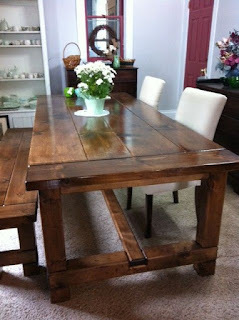 It bothers me that I will never have a formal dining room. and there's not a lot of wall space for photos and décor, there seems to be a window, door or tv on every space available. but c'est la vie, these aren't deal breakers. 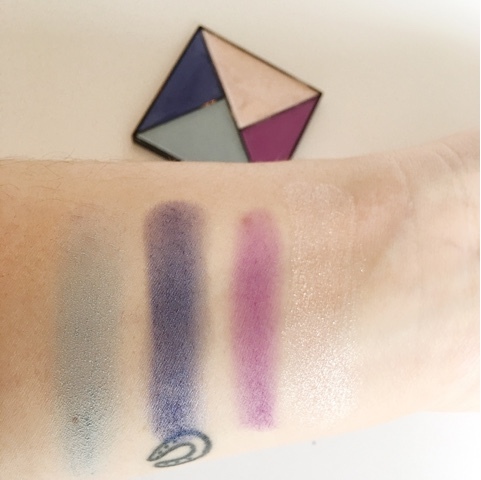 it does make for tough blogging situations, I cannot seem to get a good angle to photograph from! 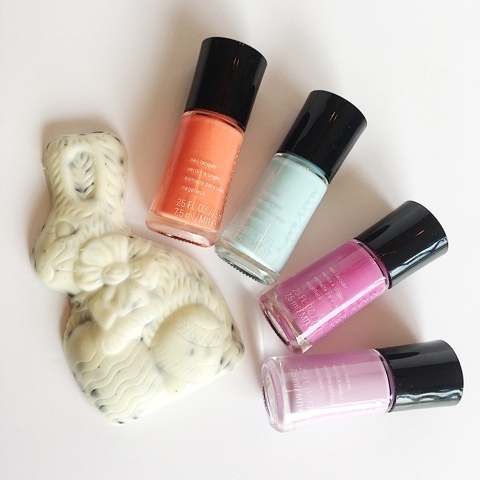 there's an open background in all my blog photos! 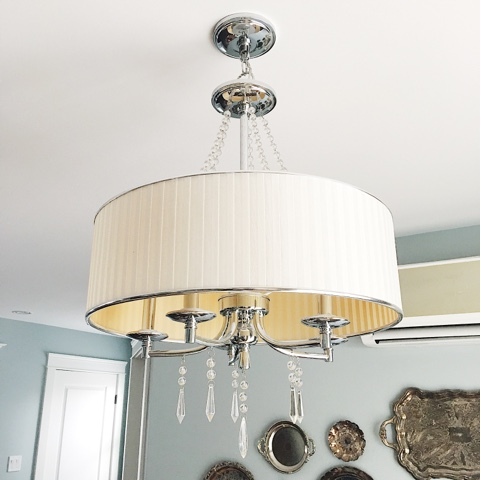 I'm about to show off my new dining room light fixture but man there was no good way to photograph that thing! 1. open background! everything always looks cluttered! 2. heat pumps! so helpful and necessary but they're are ugly! 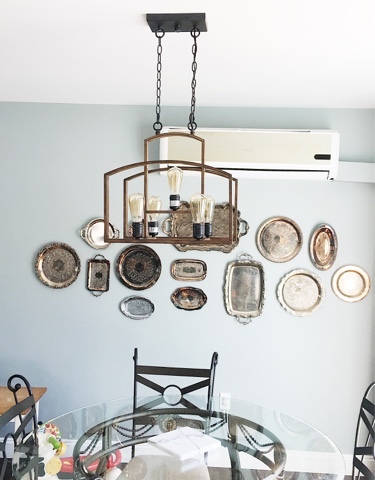 our house is only about 4 years old so the fixtures were fairly new and very nice but the dining room fixture was a bit fancy for me. 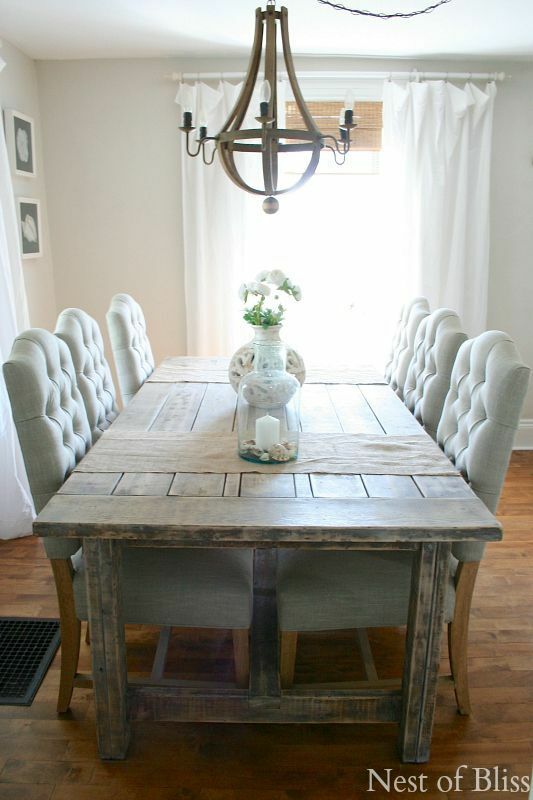 again I would've loved it in a formal area but my style is more farmhouse chic throughout so it made sense to switch it out. I wish so badly we could install this in the new baby's nursery! but in the bedrooms we have new ceiling fans that are connected to remote controls..
you have no idea how handy it is to take the remote to bed with you and not have to get up to turn off the lights when you're ready to sleep! hahahah that sounds so 'first world problems' but I don't want to take that luxury away from the baby! 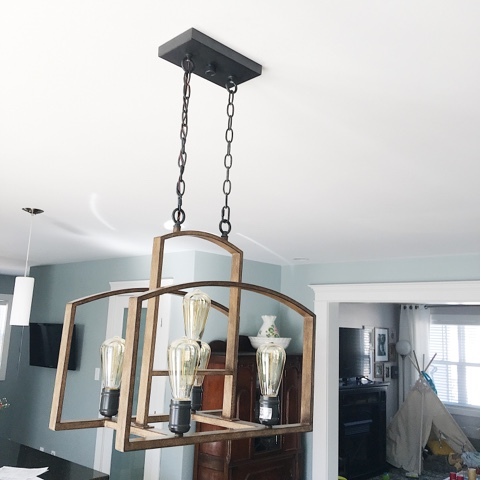 *we could maybe find an electrician to swap out the fan and connect the remote to this chandelier but currently my dad does all our light fixture hookups soooo free vs pay.. we choose the free! 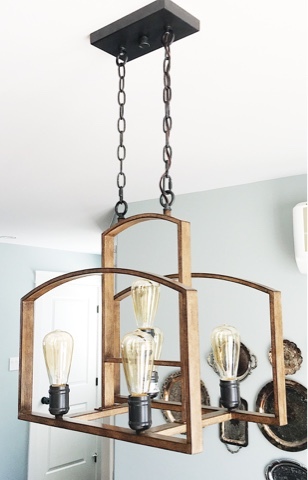 I find looking at the photos I prefer this fixture because it compliments our round glass table but I am hoping to trade in this table for a long rectangular harvest table in the not so distant future! NOW see our new fixture! 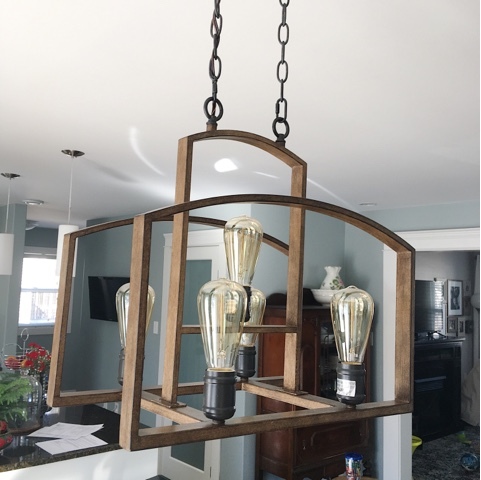 Of course I searched every section of lighting on the Costco website and cannot find this exact fixture.. but they have similar and really reasonable prices. It was impossible to get a great shot of it without a heat pump in the background! but picture it with a harvest table below and a gorgeous long runner with some greenery or fruit in a bowl directly under the lighting! Ok, the days are literally flying now! I hope this keeps up until June. Its mostly because I sleep through them.. hahahh nervous laugh.. 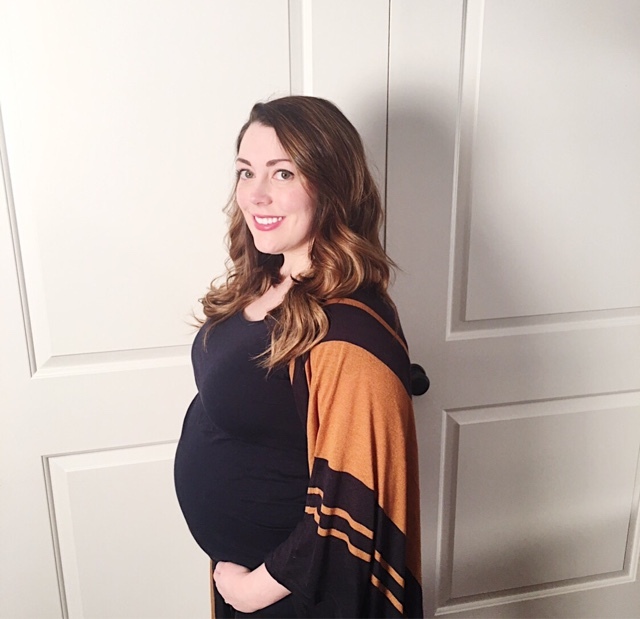 I'm feeling WAY more uncomfortable now and its taking me light years to get ready for anything..
but we did manage to get to the mall last week and I picked up a couple of new Maternity pieces from Old Navy. he does not want to pose for photos with me anymore! he knows I want them and he knows he can refuse and it becomes a game, the little ham! I have been LIVING in this dress! really, I wore it 2-3 times this week! long sleeves- check! my arms have really filled out with the weight gain and I'm not a huge fan of my arms on a good day.. so I find long sleeves more comfortable. and in the spring/summer I like to throw on a denim jacket with sleeveless maxi dresses. 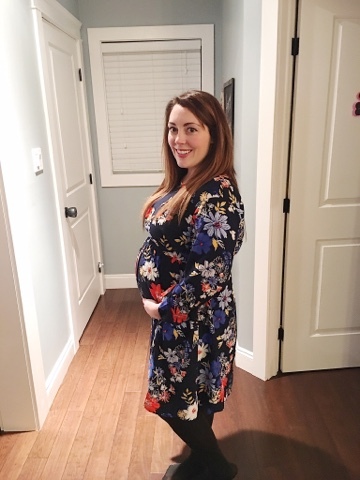 I can see me wearing this up until baby comes, for now with leggings and booties and with flats/sandals coming up very soon! 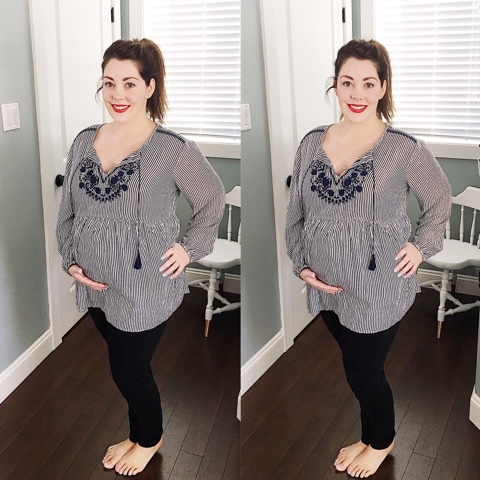 My favorite opaque tights come from H&M and my lesser favorite from Motherhood maternity. I will have to take a insta story of how tight the top of motherhood maternity tights are.. 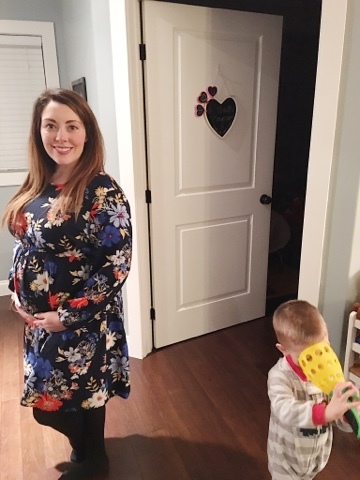 I get that 'they' haven't been able to invent a pantyhose that isn't teeny tiny around the waist section yet.. but you would think it would be top priority for the maternity range at least! geesh, my belly is not happy with that suckage in-age.. I wear them out in public and pull them straight off as soon as I'm home! 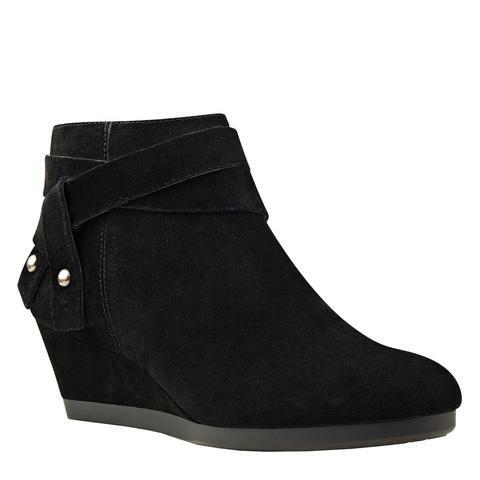 heads up, this time last year I hit a major bootie sale at nine west in Mic Mac Mall and stocked up! the shoes were on major sale with additional sales and ended up being in the 25-35$ range! I've been wearing those booties ALL WINTER LONG. I got a pair very similar to the ones above but they are navy! I've worn them with everything! the ones above are $149 going for $59.. still a great deal but if you keep your eyes peeled.. show up in store within the next few weeks I bet they will get a further mark down! How annoying is it that I cannot find my floral Old Navy dress online!? I know it was new stock because they had a whole rack full..
but if you hit up in store I bet it will be there! I also picked up this hippy peasant style top..
it is very flowy which equals so much comfort but it also equals adding the extra poundage look..
could not find this top on the website either, which is a bummer because they had it in this stripe pattern and also a really great tomato red! 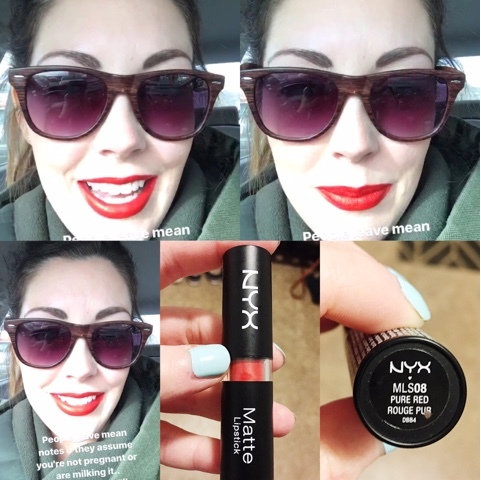 I of course, went with the stripes because I love to wear red on my lips and I was reminded of how great these NYX matte lipsticks are when I wore it in my insta stories the other day! 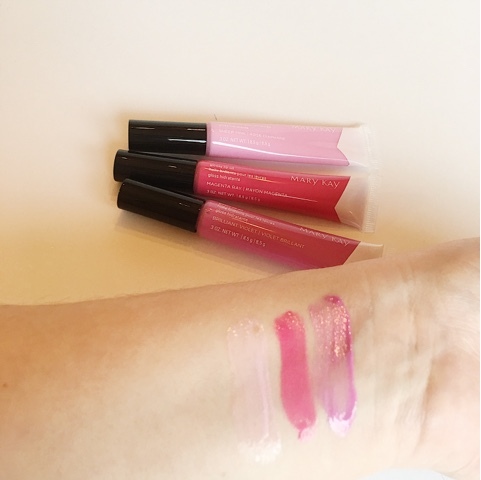 one of my favorite shades and with the blot of a Kleenex, it stays put on your lips! Other than that I have 101 things on the to do list, I have a bundle of beauty to talk about and another doctors appointment next week. so a weight update will be coming then, I am still addicted to cheeseburgers so I'm sure its going to be ugly! I am not lying to you, the baby wants cheeseburgers like CRAZY! I have never wanted fast food like this in my life.. its really, really annoying and almost disgusting.. I'm not a fast food fan and I'm trying to stay off the gluten, so I try to take off at least one bun and eat the burger open faced.... but the baby LOVES it. the good news is that my skin seems to be getting back to normal and has lost its oily flare! I'm also working on a Harry Potter project that I hope, can get finished up asap since its been on my to do list for, foreverrrrr!